The year is 2014. The year synth music exploded open for me. Carpenter Brut was gaining lots of attention, Perturbator’s album “Dangerous Days” stays in the top 10 charts of Synthwave to this day, and Timecop1983’s “Journeys” releases. To me, those releases are out of this world. But also, to me, there was one release that stayed in this world, it sent me back somewhere I always wanted to be, and had never been. The year is 2014. The year synth music exploded open for me. Carpenter Brut was gaining lots of attention, Perturbator’s album “Dangerous Days” stays in the top 10 charts of Synthwave to this day, and Timecop1983’s “Journeys” releases. To me, those releases are out of this world. But also, to me, there was one release that stayed in this world, it sent me back somewhere I always wanted to be, and had never been. 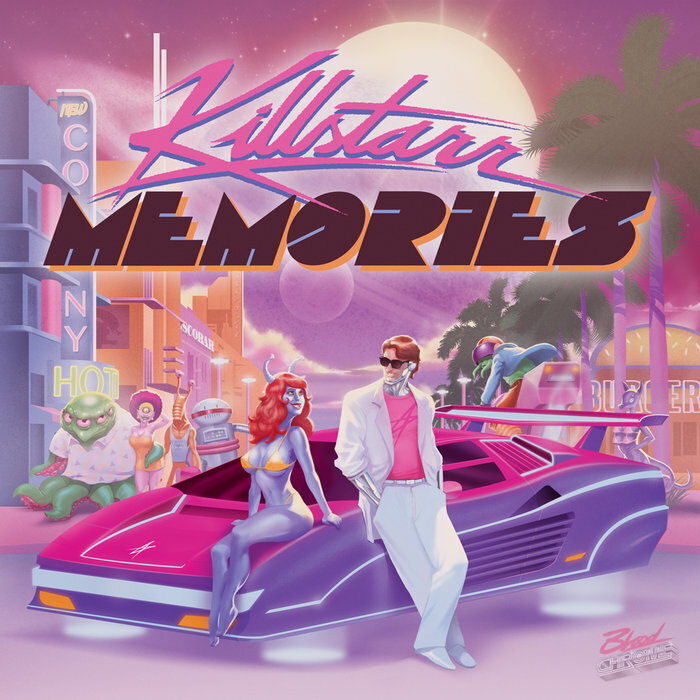 Killstarr is, like ORAX, one of the first synth artists I listened to. His “Memories EP” shows my love for the synth scene, in fact, it was the first album I ever had. So for my third review as of today (June 8, 2016), it’ll be Killstarr’s debut EP. “Feels Like Heaven” is the first track on the album ,and features vocoder lyrics (I assume) sung by Killstarr himself. It’s relaxing, chilly, perfect slow Daft Punk material, it’s like the ending song to a romance movie, like Say Anything. The song might be 4 minutes and 26 seconds long , but it feels like it’s never-ending to me. It really does feel like heaven. “Dark City” takes a more action-based and dark approach, contrasting the sunny shine of the previous track, and this track might not entirely fit the actual movie Dark City, but it does fit the old Italian post-apocalyptic films, maybe even something like Road Warrior. It’s also quite a montage song, too. Replace the Rocky song in the first film with this, it really works. The third track has to be my other favorite, besides “Feels Like Heaven”. “Standing In The Rain” is another slow track, featuring a romantic and shredding guitar in the background, which so happens to be Jon Reilly, aka Jon of the Shred, playing. It’s like a coastal walk with the one that won’t get away, as long as you hold her tight. “Summer Drive” was the single released for the EP, and it’s definitely the best track for the job of promoting a new artist’s debut. It’s slow and chill outrun, it’s popping, it’s bright, it’s vibrant, it’s bouncy, it’s the 80’s so what do you expect? “Memories” is the title track, as well as the final track on the EP. It has this tinny feel to it, like it’s playing straight from a cassette, some of the synth sounds remind me of film studio logos and such, like the opening credits of a movie. The album is entirely like a film score, reminiscent of Harold Faltermeyer, and also reminding me of artists like Tim Feehan. This review is short, sweet, and simple. The album, is short, sweet, and definitely not simple. It’s outstanding.